This past Christmas, The Salvation Army received a call from hospice asking for toys for boys and girls. We were able to grant some of the children’s last wishes. A 16 year old boy with terminal cancer was able to get a guitar for Christmas through The Salvation Army. Another child was given the bike he always wanted. The families were extremely grateful and told The Salvation Army that their holidays were a little brighter, despite the difficult circumstances. The holidays bring many joys like Thanksgiving dinner, Christmas trees covered with glowing lights, seeing your children’s face light up as they open presents, and spending time with your family. But the holidays also can bring additional financial and emotional stress for families in need. 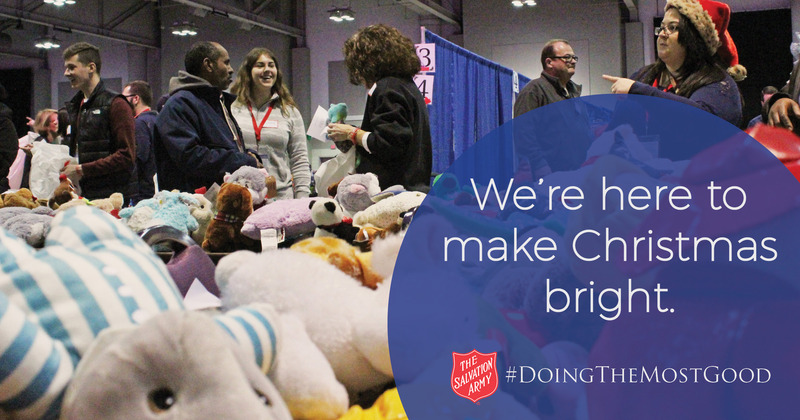 From distributing coats and mittens to helping with additional financial costs, The Salvation Army helps make the holiday season a little brighter. Being able to spend Christmas dinner at home with your family is a blessing. We want more people to have this blessing, regardless of their income or circumstances. That is why The Salvation Army offers food baskets during the holiday season. When individuals come to one of our food pantries during the months prior to Christmas, they are asked if they will need additional help during the holiday season. If they do, they can receive an inviation to a Christmas meal or a food basket with enough food to last the entire week of Christmas. This way, more families can enjoy the blessing of their families during the holiday season. The Salvation Army believes every child should celebrate the holiday season with a sense of awe and wonder. To that end, we do everything in our power to ensure as many children as possible receive presents to open. A simple toy can make the season bright for a child and bring financial relief to a struggling parent. The Salvation Army receives toys from its corporate partners, partnerships wtih local businesses (through toy drives) and the generosity of volunteers and local donors who share our mission. Toys are distributed in a variety of ways during the holiday season. Contact your local Salvation Army Center for Worship and Service for more information on how to give or receive toys during the holidays.